Over the years, scientific ideas have changed. Sometimes this is because a new observation has come to light, and sometimes it’s because existing observations seem to fit better into a new theory. Science, then, is about fitting evidence (observations) with ideas (theories). If a theory is very strong (supported by lots of observations) and very useful (explains something really well) then we believe it. 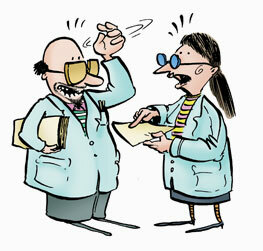 But if a better theory comes along, then scientists are prepared to change, even if they argue for a while first! An idea which is important for scientists who believe in God is that their religious beliefs should be consistent with other things they know. 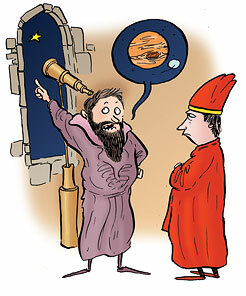 For example, their religious beliefs should be consistent with the ideas that have been discovered through science. But sometimes – in a dramatic twist – the picture from science changes. Suddenly, in the light of new evidence, scientists switch to a new theory. What are we meant to believe then? This is the question that Galileo had to consider, when he realised that his new scientific understanding of the solar system conflicted with the view of the time. Galileo’s answer was that God made a Universe that can be investigated scientifically – and we should be open to changing our minds about things we thought were certain. Editor’s note: On this website the view that is discussed most is the mainstream science perspective and the mainstream religious perspective. Our aim is to show how scientists today who believe in God, make sense of science and religion. Many other perspectives are consistent with science, including atheism. Always be wary of ideas that don’t ring true for you. Your teachers and parents and other people you trust are your best guides when you are not sure.